It’s crazy how fast the Colorado mountains transitioned from buried to dry. Most standard 14er routes only require a few short snow crossings these days, which is hardly believable after all the late-spring moisture. 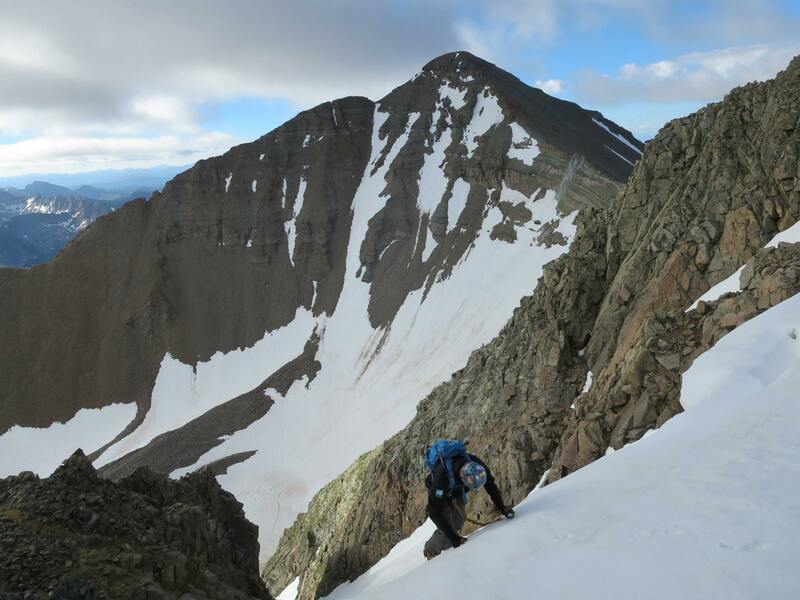 The wet weather made for a weird couloir season, with the window between “avalanche prone” and “rage-inducing scree field” short and difficult to judge. 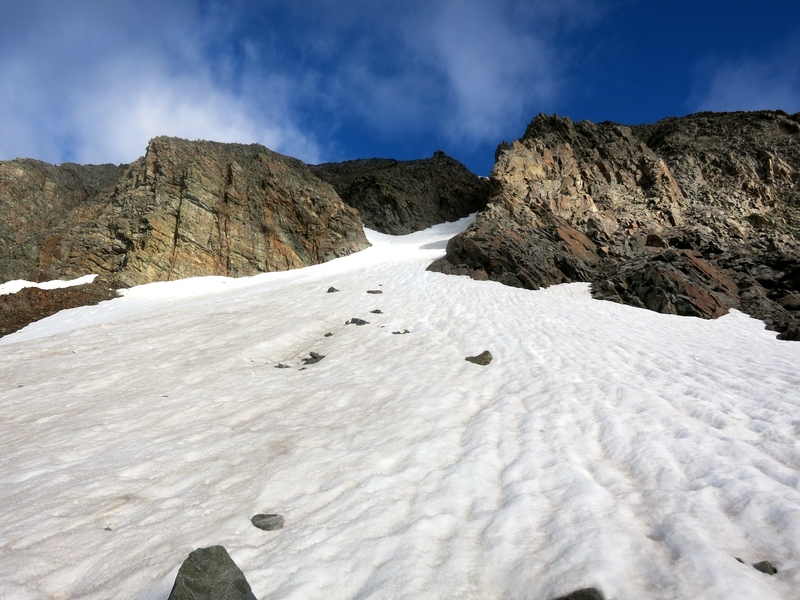 Few traditional snow couloirs remain in mid-July, but what’s left is generally safe. Ben and I decided to attempt one more before the soaring summer temperatures claim the last of the continuous snow lines. My original idea was Cross Couloir on Mt. of the Holy Cross, an incredibly famous route that’s gathered dust on my to-do list for years. Ben, who’s trying to finish the 14ers this summer, was more interested in two new checkmarks on Castle and Conundrum. A few minutes of research uncovered that Conundrum Couloir, another classic option, was likely still filled. A plan was born. 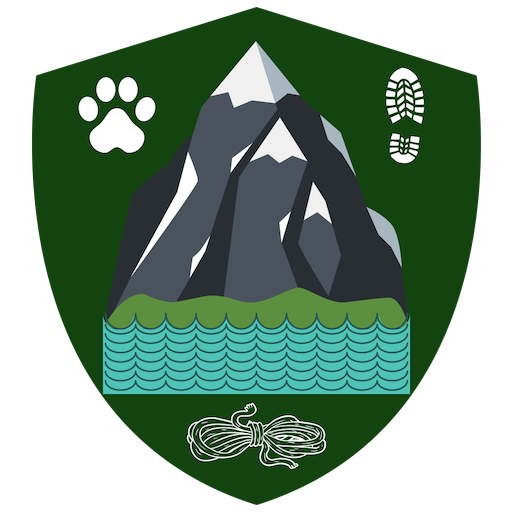 Our intention was to meet in Golden around 3 p.m. and depart directly from my office at the American Mountaineering Center. That would give us plenty of time to establish a camp, start a fire, drink a couple beers and catch up. Unfortunately, Ben got stuck at work and then in the heinous Highway 93 traffic. 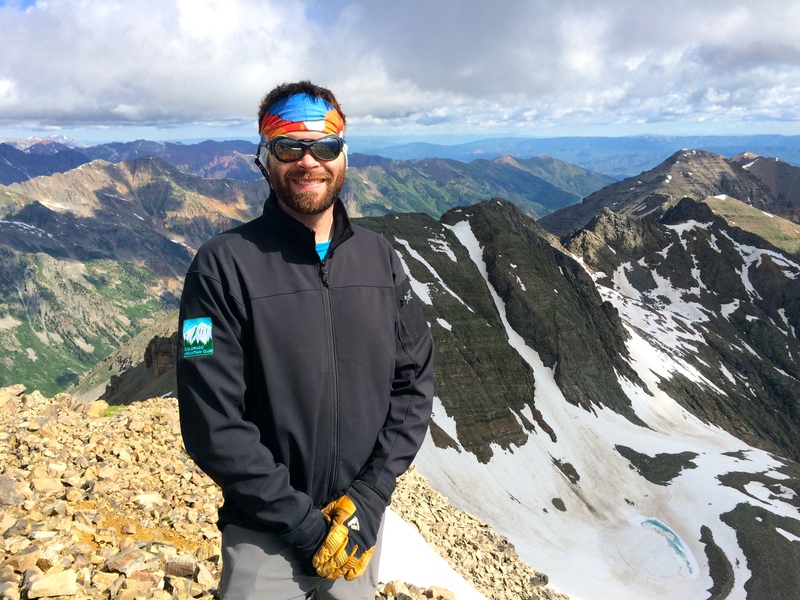 He didn’t get to my office until shortly after 5 p.m., which might be the latest anyone has worked at the American Mountaineering Center on a Friday since at least 2009. The result was arriving at the Castle/Conundrum trailhead around 9 p.m. My low-clearance 2WD Mazda 3 could only make it up the road far enough to reach the first four campsites, all of which were inhabited by squatting retirees from Texas. We limped back to the pavement and debated our options. Signage made it obvious that no camping is allowed apparently anywhere, ever. Given the late hour and our 3 a.m. wake-up call, we figured no one would notice if we just set up our tents in the corner of the parking lot. It meant packing all our gear first thing in the morning rather than leaving it up to dry, but our assumption was correct. We snagged a few uninterrupted hours of unsanctioned sleep. Don’t tell anyone, Internet. Rather than risk my car’s oil pan to crawl a half-mile up the road, we decided to hoof it from the paved highway. 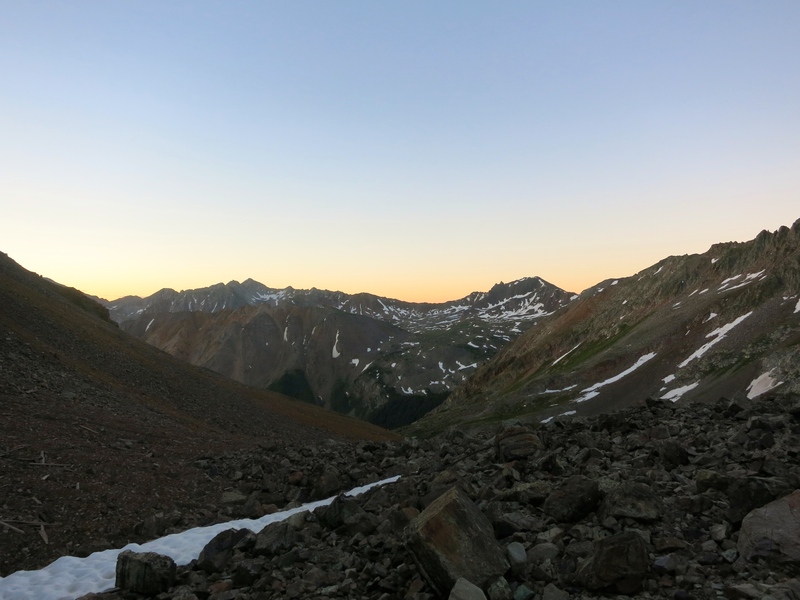 Sunrise greeted us a couple hours later high in Montezuma Basin, well beyond the Pearl Pass turnoff. Pre-dawn road walking is an easy way to pass miles and time. Our solitary vigil ended along with the road. A pair of solo hikers caught us while I was transitioning from trail runners to mountaineering boots, and a brave soul in a stock 4Runner arrived carrying a full cab of hitchhikers. Our newfound crowd began moving up the snow-covered headwall together. Ben and I opted for crampons and a direct line up the snow, while others found a more-or-less dry path through the rocks. 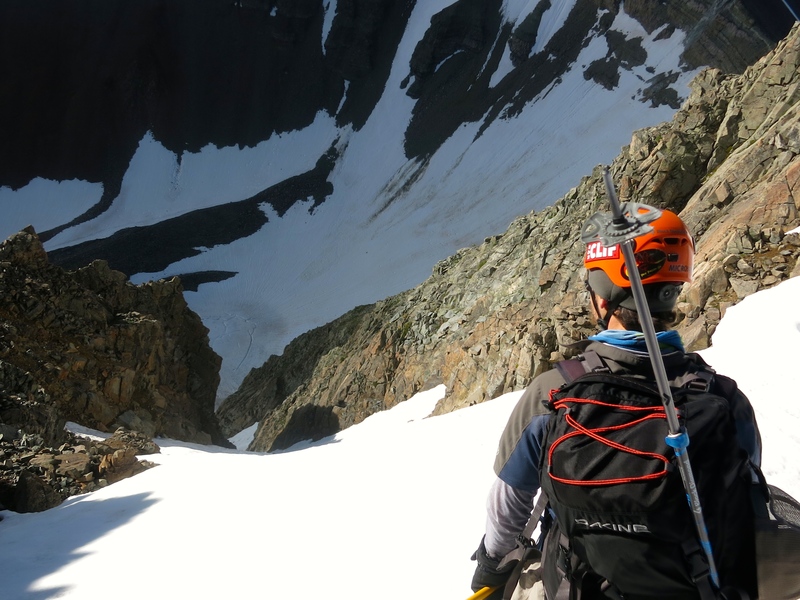 A big push up steep terrain delivered us to the upper cirque, where Conundrum Couloir was beautifully filled. No decision needed to be made here. We’d stick with the original plan. Surprise cloud-cover, a steady wind and the early hour meant firm snow conditions. The moderate apron quickly gives way to steeper terrain, and the morning fog dissipated from our heads as the need for focus increased. The choke point about halfway up turned out to be the crux. The angle hovered around 50 degrees, and the inset nature of the section meant a general lack of sun. The hard snow meant Ben could only produce minuscule steps, which I did my best to widen with a few extra kicks. Solid ice ax self-belays did provide an extra measure of confidence and security. The angle relaxed slightly as we climbed above the choke point and approached the massive cornice. This late in the season, an easy exit existed on the right. 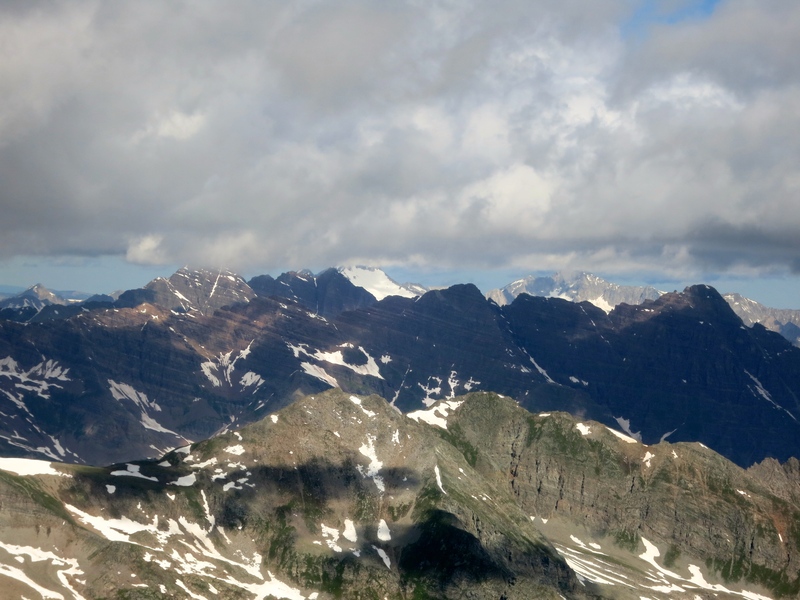 A few more feet of 50-degree snow deposited us on the saddle between Conundrum’s twin summits. We scrambled up to the high point and enjoyed the rare summer solitude. Castle was beginning to look crowded, and a few people had started to traverse over, but for about 20 minutes we had the top to ourselves. The multiple forecasts calling for calm and sunshine looked worse by the minute, with clouds building and an incessant breeze that forced us into down jackets. 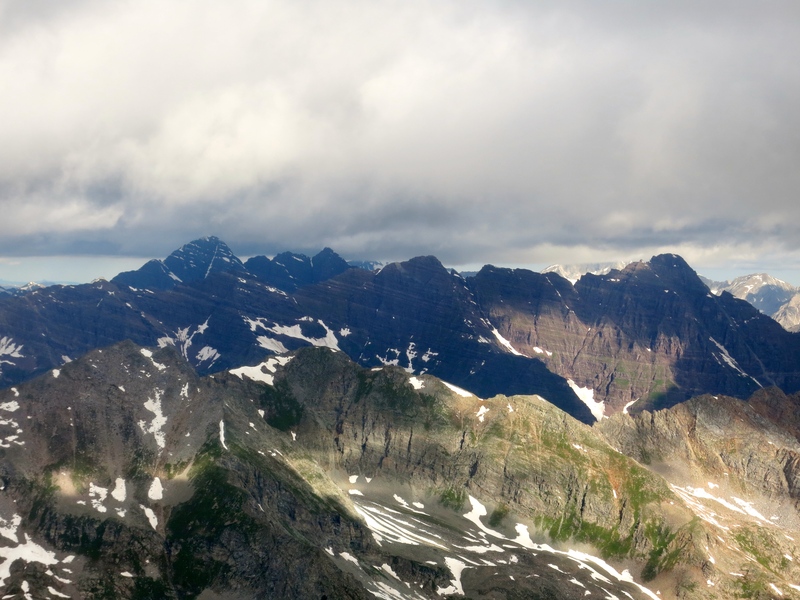 Still, we were treated to inspiring views of the surrounding Elk Range giants. 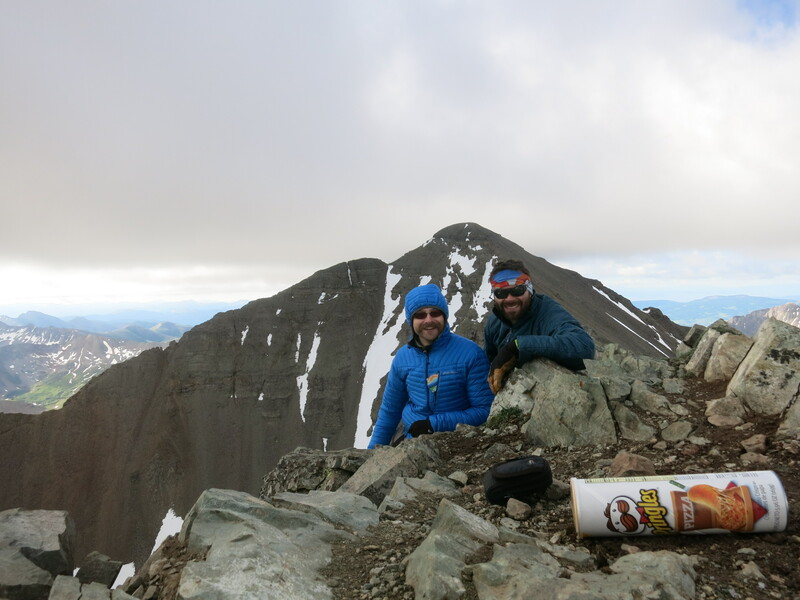 The fun was over for the day, but Ben also needed Castle Peak to notch his 53rd Fourteener. Rather than blissfully glissade the Castle-Conundrum saddle for a quick reunion with beers and burgers, we had to slog up a couple hundred more feet of crumbling Elk rock. It was all worth it, of course, to stand on the range’s highest summit. Stellar views of Snowmass, Capitol, the Bells and Pyramid were a worthy reward. We spent another 15-20 minutes snapping photos before the worsening weather urged us to retreat. 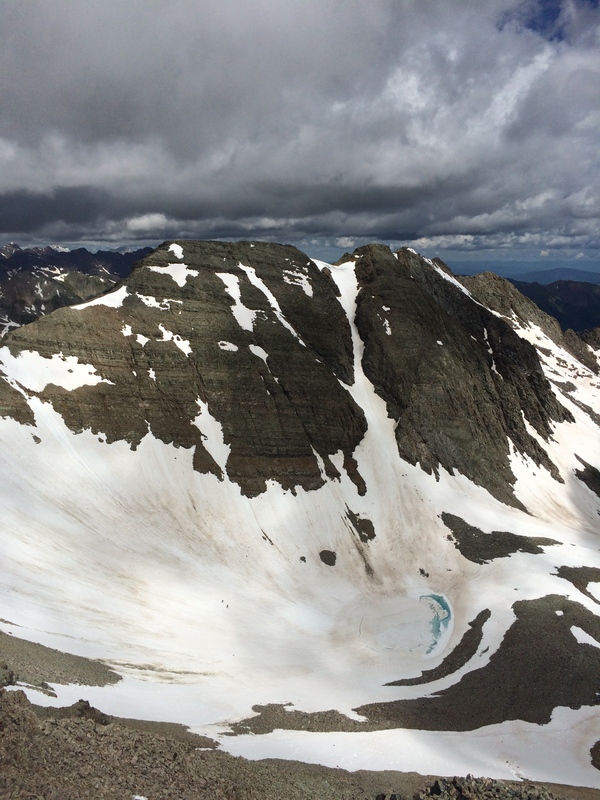 We opted to take the standard Northeast Ridge down to complete a loop of the cirque. A couple hundred feet below the summit, I was shocked to hear a female voice casually say, “Hi, Jeff.” Standing just below were Zach Smith, Noel Finta-Johnson, and their hiking partner Joe. Random encounters with friends in the mountains are always welcome. A graupel storm kept the descent interesting. The weird weather would hound us all the way back to the car, alternating between blistering sunshine, pouring graupel and brief rain showers. The crux of the day was deciding what layers to wear while walking down the road. I might have gotten a late start, but I was able to salvage a bit of this couloir season the past couple weeks. 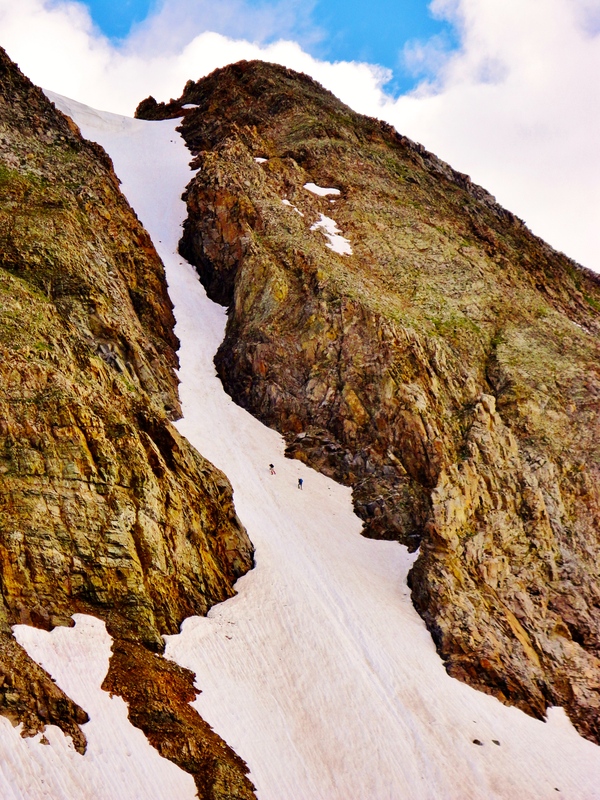 Classic routes like Conundrum Couloir are a great reminder of the joys of steep snow. The crampons and ice ax will now get shelved for a few months before the fall ice season begins, but it’s hard to feel depressed with summer scrambling, multi-day backpacking rambles and long nights around the campfire with good friends on the horizon. Winter is coming, but summer is here. Might as well enjoy it. Ingtllieence and simplicity – easy to understand how you think.